"...an example of the best digital playback currently available -- with CDs and SACDs." I first crossed paths with Esoteric digital products at CEDIA Expo 2002. Since then, I have written three very enthusiastic reviews -- of the DV-50 universal A/V player, the P-70/D-70 CD DAC/transport combo, and the X-01 CD/SACD player -- and each ended with the subject being named a Reviewers' Choice. Add to this Jeff Fritz's recent review of the UX-3 universal player, and Esoteric is batting four for four with SoundStage! reviews that lead to Reviewers' Choice nods. No other company has such a record. But in the world of high-end audio, even great products have a shelf life. For engineering-driven companies like TEAC, of which Esoteric is a subsidiary, R&D never stops, and this leads not only to completely new products but also the updating of existing successful ones. The X-01 is in this latter group. While it seems as though the X-01 just hit the North American market, TEAC is based in Japan, where Esoteric products are available months before they are in the US. The subject of this follow-up review, the X-01 Limited, appeared in Japan last fall and is only now available in the US. Better late than never. With the X-01 Limited, Esoteric's engineers have used a number of improved parts, but the heart of the player -- its VRDS-NEO transport mechanism and Burr-Brown PCM1704 DACs in a four-chip-per-channel configuration -- stays the same. Specifically, much internal wiring is of a special 6N, or 99.9999% pure, copper developed by Mitsubishi Cable Industries and Acro Japan Ltd. Internal connectors (circuit-board sockets and the like) and the unit's power cord are those from Esoteric's flagship digital products, the P-01 transport and D-01 digital-to-analog converter. The X-01 Limited also uses upgraded capacitors and resistors along with circuit changes from the P-01/D-01 combo, which, according to Esoteric, has improved the audio performance of the digital-to-analog-conversion circuitry and output stage. Finally, RCA analog and digital outputs now use WBT NextGen jacks, whose main advantage is freedom from the deleterious effects of eddy current. The X-01 Limited costs $13,500 USD, $500 more than the X-01, and it comes with a three-year warranty instead of the X-01's single year of coverage. TEAC America is currently assessing the viability and potential cost of an X-01-to-X-01 Limited upgrade for North American owners. "The upgrade is very complex and requires hours of modification time," says Tim Crable of TEAC America. "Options are being studied to ensure that the upgrades are completed to Esoteric standards." Physically, the X-01 and X-01 Limited are identical except for a small gold-colored plate on top of the latter and the NextGen RCAs, which are identified by the spiral of gold plating around their barrel. Operation is identical as well; in fact, initial units include a copy of the manual for the X-01. In its finely brushed silver dress, the X-01 Limited is an Esoteric product through and through: made to standards that no other company attempts, at least in the realm of audio electronics, and exuding elegance to boot. From my experience, the only company that makes more stalwart products than the X-01 Limited is Esoteric itself. The P-01/D-01 and new P-03/D-03 transport/DAC combos are testaments to the extreme lengths to which Esoteric will go. And in many ways, this applies to sonics as well. I praised the X-01 for its "precision and incisiveness," along with its "definition and heft" in the bass. Upgraded products rarely sound radically different from the original, and rarely provide radical improvement. Everything I said about the X-01's sonics applies to the X-01 Limited's. Its sound is detailed and forceful -- it is no dainty digital flower. It captures the ambient information recorded in the pits like few digital components can. The bass is crushing in its power, drive and slam. The unit's resolving power is as great as that of any digital component I've heard in my system. But, even with all of these similarities, I find the X-01 Limited more appealing and involving than the X-01, and I am still trying to discover exactly why this is so. It is true that it sounds more composed, less insistent, but this by itself doesn't translate to greater involvement. The level of detail is still there, and so are the bass weight and drive. Maybe the abundant inner detail and bass bloom are what make the X-01 Limited more enjoyable. Against its CD-playing competition, the X-01 Limited really struts. Its resolution is seemingly limitless, but, at the same time, its sound is highly integrated -- not merely a collection of exceptional parts, but rather an exceptional whole. I have over 2500 CDs, many of which are mono. We fans of classic jazz are fortunate to have available the many remastered recordings in the Fantasy Jazz K2, Sony Legacy, and Blue Note RVG series. However, the king of jazz remasters is JVC XRCD, and my favorite XRCDs are the 1950s piano-trio recordings JVC issued together a few years ago. These recordings sound almost modern played on the X-01 Limited. The soundstage of each belies its mono origins, so well does it spread laterally, and the bass is both forceful and well defined -- surprisingly so. The X-01 Limited breathes life into these recordings, some of which are a half century old. It is an exceptional CD player. That the X-01 Limited also plays SACDs can be considered a delightful bonus. 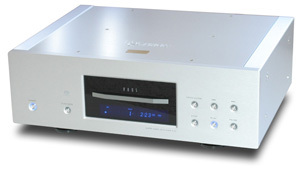 As with the original X-01, the Limited converts the DSD data stream to 88.2kHz PCM and then to analog. You might think that this means CD and SACDs would either sound the same or lose some of their distinctiveness. Not true. Played on the X-01 Limited, SACDs retain the accomplished sound of CDs, but also convey what makes them special: the high-frequency purity, the sense of hearing into the recording, the sound of the master tape. SACDs are simply better, making you pull for the continued existence of the format. An interesting test of this is the well-known Dire Straits album Brothers in Arms. It is available as a standard CD [Warner Bros. 25264-2], a remastered CD [Warner Bros. 47773-2], and a hybrid SACD [Vertigo 9871497]. I have all three, and the X-01 Limited made the differences among them as plain as sunshine. I've owned the standard CD since shortly after the album was released in 1985, and while it sounds good, the remastered CD is clearly better. The original sounds less open and more splashy in the treble than the remastered version, more synthetic overall. The SACD is louder (from either the SACD or CD layer) and more detailed as well. On "So Far Away from Me," the X-01 Limited conveys more air between drum strikes, which project into the room with greater speed and energy. They also decay longer, with an abundance of resonant detail. There is simply no comparison. One note about using the X-01 Limited to its utmost capabilities: While every sonic point I've made in this review applies to the player balanced or single ended, the X-01 Limited's audio circuit is heavily weighted toward balanced use because of its four-chip-per-channel configuration, and this is how the player sounds its very best. The greater clarity and smoothness along with improved delineation of instruments are obvious. By no means does the X-01 Limited sound bad single ended, but it is unquestionably at its best through its balanced outputs. 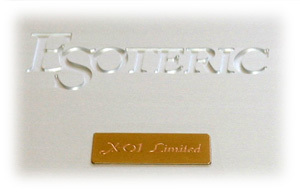 If you plan to use the X-01 Limited single ended, you should also audition Esoteric's X-03 CD/SACD player. It, too, is fully balanced, but it uses two Burr-Brown DACs per channel instead of four (this is the same audio circuit as that in the UX-1 and UX-3 universal players). Also, its VRDS NEO transport mechanism isn't quite as robust as that used in the X-01 Limited. However, the X-03 costs $7500, $6000 less than the X-01 Limited, and it may sound very similar through its single-ended outputs. While the X-01 Limited isn't a revolutionary revision of the X-01, its sound is certainly improved, making it a more engaging CD and SACD player. It is an example of the best digital playback currently available -- with CDs and SACDs -- and yet another Reviewers' Choice digital product from Esoteric.